If you have kids make all attempts not to bring them with you as they will prolong the process and hence cause you unduly stress. If you have to bring your kids let them know the ground rules first – e.g. they can not pick five different cereals and/or ten snacks. As well, it is important for your kids to understand that the grocery store is not a safe place for playing and they can seriously injure themselves if they do not behave – perhaps they can be rewarded with their favorite treat for good behavior. It is important to have an ongoing list and to update it as you come across items you need around the house. This will enable you to get all the items you need and not have to go back because you forgot one or two things – from our experience whenever you go shopping you end up picking up a few more things then what you initially went for. Hence, it’s important to make a list of all the items you need and to finalize this list with your partner before leaving home – perhaps checking to make sure you have everything on the list. Making a list is simple with today’s technology as it could be on your phone and you can update it anytime, anywhere. Recently we found a great app that helps share list with anyone you want. With AnyList you can start a list and share it with your spouse so you both can update the list as needed, we have been using it for the past 3 months and it has been great. It is a FREE app in the app store. 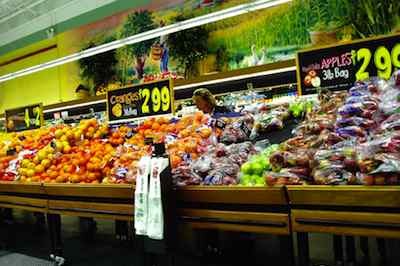 A lot of us receive flyers and coupons from our local grocery stories and we fail to utilize them. My husband and I browse through the flyers quickly over breakfast and help ourselves to any coupons that are of use to us. A tremendous amount of coupons that enable customers to take advantage of cost savings are not used and go to waste – this is free money people! As well, most of the time grocery stores (and others) have door crashers – these are items on sale that help generate traffic for the store and sell other goods – and it is sometimes worth the trip to take advantage of the discounts. However, please remember to pick up the item(s) you are there for and leave if this is not your scheduled grocery trip. With the growth of the internet there are various other places you can find coupons that can help you save money on your groceries. Another reason it is important to have a shopping list is so that we don’t get caught in the whirlwind of shopping and pick up items we won’t use. If you are picking up an item that is not on the list ask your self if you need it and when and how you’ll make use of it – i.e. will you be making a meal with it, etc? Not only is it important to buy what will be utilized but it is also important to buy in portions appropriate to your family. A lot of times we see a sale on something and we over-purchase. It is essential to note that while some items are great to buy on sale, i.e. toilet paper, cooking oil, others might not last long enough. When grocery items are near their expiration date the store puts them sale so that it can get rid of them. This is great because shoppers get a deal but keep in mind to buy the appropriate portion so that your family is able to consume it before it expires. A great idea that can save a lot of time and money is to plan meals in advance. Thus, when shopping you are sure to pick up the required ingredients for your meal and don’t resort to expensive and unhealthy alternatives – e.g. fast food. Having your meals preplanned helps your family eat a variety of healthier meals at a lower cost. Of course, if you run out of ideas you can always search online for delicious healthy recipes. You may have heard/read this before and it is definitely true. If you go shopping on an empty stomach you are bound to buy too much and to buy unhealthy and expensive foods – which will appeal to your senses. Therefore, have a good meal before go out to shop. For our Canadian readers remember to take your reusable grocery bags so that you can avoid the $0.05 charge for grocery bags. This is also a good exercise for our non-Canadian readers as it helps us sustain the environment! How do you make your shopping fun and easy? How do you keep your costs low? Please share your tips with our readers! I have to say, my wife and I really like doing the grocery shopping. We follow most of the tips you mentioned, and having the list makes it like a scavenger hunt. We go in, get what we need and leave and we always shop together (though some say shop alone to save money). Buy things you k now you can use for more than one meal. for example buy chicken knowing you can use half to put in one meal maybe with a salad and the next night with pasta so you have two dishes and can save money. I compare prices first in the brochures that I receive in the mail or with the coupons in the newspaper to make sure I get the best deal. Totally agree with you, Grocery shopping is no fun at all with or without the kids. Checking all flyers for the best deals, making a list and planning and taking the most direct routes in case you have to hit up more than one stores is a definite must so as to maximize on savings. What’s your take on this story? My wife and I rather enjoy hitting up the shops looking for the best deals and new foods to try. We plan our shops, use coupons, price match and grow alot of our own vegetables and herbs in the summer time. Shopping doesn’t have to be boring.. open up your mind, open up your cook book and then open up your mouth and enjoy! We used to spend upwards of $500 a month on grocery using coupons but realized for 2 people that was still too much. I started The Grocery Game Challenge at my blog where we spend $190 a month with 1 no shop week per month. So far it’s been awesome and lots of fans have been playing with us. Posting our shop and being mindful of our budget have been essential in keeping the money in our pocket. I definitely agree with leaving the kids at home. Not only does it add an extra 30 minutes to the trip, but you’re right that it adds stress and causes you to lose track of your list at times. I also don’t like the expectation of a treat at the end. I expect my children to be well behaved at all times (at least in public) and I don’t think bribery is the best method. I always forget to bring my re-usable bags, but they come in handy…especially at Costco. I always bring along my portable calculator to keep track of my grocery bill. I know what my budget allows for and if I see that I’m close to the target amount…I hold off on that impulse buy or decide to wait another week before buying something that is on sale ..even tho I have enough already….i.e. peanut butter or toilet paper. Another good piece of advice: Avoid grocery shopping when you are hungry, as there is a greater chance you will buy something that you don’t need, and that isn’t healthy. I’m one of the developers of the AnyList app. Thanks for mentioning it in this article! I agree that making a complete and organized list is helpful in staying on track and avoiding impulse purchases. We plan to add the ability to keep track of item prices in a future update to AnyList, which I hope will make it an even more useful tool for shopping on a budget.